ಈ ಸೊಪ್ಪಿನಲ್ಲಿ ಅತಿ ಹೆಚ್ಚಿನ ಪೋಷಕಾಂಶಗಳು ಇರುತ್ತವೆ. "ಎ', 'ಬಿ' ಜೀವಸತ್ವಗಳು ಕಬ್ಬಿಣ, ಪೊಟಾಸಿಯಂ ಅತ್ಯದಿಕ ಪ್ರಮಾಣದಲ್ಲಿದೆ. ಆರೋಗ್ಯದ ದೃಷ್ಟಿಯಿಂದ ಈ ಸೊಪ್ಪನ್ನು ಅಡಿಗೆಯಲ್ಲಿ ವಾರಕ್ಕೆ ನಾಲ್ಕೈದು ದಿನಗಳಾದರೂ ಬಳಸುವುದು ಒಳ್ಳೆಯದು. ಇದರ ಸೇವನೆಯಿಂದ ಅರೋಗ್ಯ ಸುಧಾರಣೆಯಾಗಿ ಶಾರೀರಿಕ ತೂಕ ಹೆಚ್ಚುವುದು. ಬೇಗ ಜೀರ್ಣ ಆಗುವುದಲ್ಲದೇ ಹಸಿವು ಹೆಚ್ಚಾಗುತ್ತದೆ. ತುಂಬಾ ಹಸಿವಾಗುವುದು ಆರೋಗ್ಯದ ದೃಷ್ಟಿಯಿಂದ ಒಳ್ಳೆಯದೇ. ಬಸಳೆಸೊಪ್ಪಿನಲ್ಲಿ 'ಸಿ' ಅನ್ನಾಂಗ, ಕಬ್ಬಿಣ ಹಾಗೂ ರಂಜಕದ ಅಂಶವು ಹೆಚ್ಚಾಗಿರುವುದರಿಂದ ಇದರ ಸೇವನೆಯು ಮಲವಿಸರ್ಜನೆಗೆ ಸುಲಭ ಸಾಧಕ. ಮಕ್ಕಳು ಹಾಗೂ ಗರ್ಭಿಣಿಯರಿಗೆ ಅರೋಗ್ಯ ದೃಷ್ಟಿಯಿಂದ ತುಂಬಾ ಒಳ್ಳೆಯದು. 1.The keys to the benefits of spinach for bone health comes in the form of Vitamin K, Vitamin A and magnesium. Spinach, along with other green vegetables brussel sprouts and broccoli, is one of the best food sources of Vitamin K.
2.Spinach for Heart & Cardiovascular Health - Eat more spinach. Your heart and arteries will thank you. 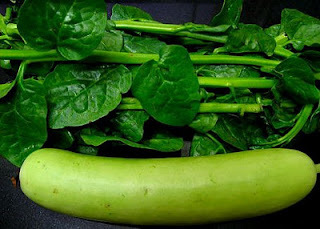 3.Spinach is rich in the mineral potassium and low in sodium. Potassium or potassium-rich diets are an effective first line of defence against high blood pressure / hypertension. Potassium salts are commonly recommended as a substitute of sodium chloride (common table/cooking salt) for people at risk of or suffering from high blood pressure. Potassium lowers blood pressure. Sodium raises blood pressure. Spinach, being high in potassium and low in sodium is therefore a clear choice for your cardiovascular health. 4.Beta carotene, abundant in spinach, is a precursor to Vitamin A. The human body converts beta carotene into Vitamin A. Deficiencies of Vitamin A (resulting primarily from inadequate intake of food sources of beta carotene, such as spinach or carrots) result in poor eyesight and most significantly poor night vision and even night blindness. Other eye-related symptoms of a Vitamin A deficiency include dry eyes, eye ulceration, burning and itching eyes.